The Bard Medical Bardex Infection Control Catheter 30cc - 30 FR is clinically proven to reduce catheter-associated urinary tract infections. The Bard Medical Bardex Infection Control Catheter 30cc is clinically proven to reduce catheter-associated urinary tract infections. Incorporating a technologically advanced formulation consisting of Bacti-Guard® silver alloy coating and Bard® hydrogel, the Bardex® I.C. Foley catheter dramatically reduces bacterial adherence and minimizes biofilm formation. The occurrence of urinary tract infection is 3-2/3 times greater in patients catheterized with a standard catheter than in patients catheterized with the Bardex® I.C. 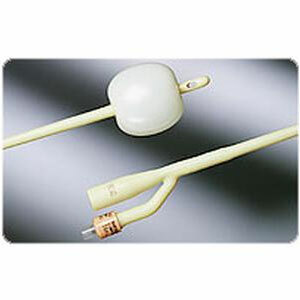 Foley catheter with Bacti-Guard® silver alloy coating and Bard® hydrogel. Contains 1 Bard Medical Bardex Infection Control Catheter 30cc - 30 FR.